Bush and Cheney invaded Iraq and Afghanistan in order to change those governments whom they suspected of enabling the terrorism of Al Qaeda. It was a state oriented policy. That it was wrong in the case of Iraq is one thing. Saddam was not enabling AQ. The resulting chaos obscures the deeper error of the policy. You see more clearly the error in Afghanistan where the Taliban was protecting AQ. But, it's still impossible to put together a viable government in Afghanistan, even in coalition with the Taliban. Obama said from the beginning that the Bush policy was stupid. The Obama policy is not directed as states and governments but at organizations that adopt the strategy of attacking the "far enemy" as a way to gain local power. Iraq is in the midst of epic civil war, and I don't believe that Obama thinks we have any real leverage or interest in the outcome that is worth our engagement. 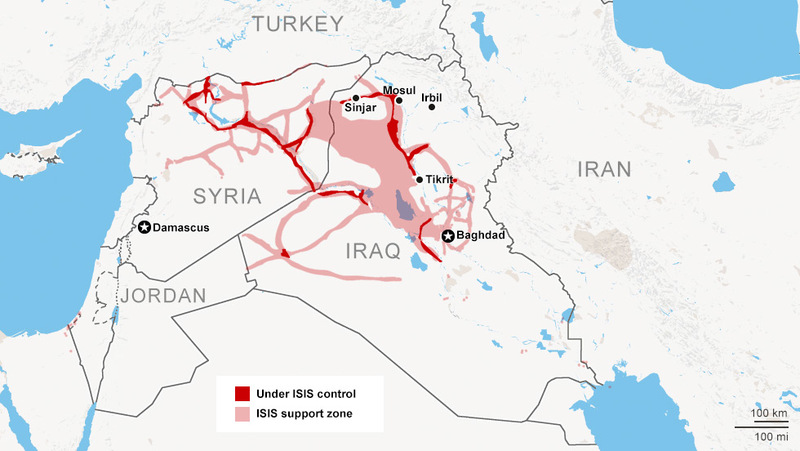 But the Islamic State had adopted the strategy of becoming the strongest Sunni force by threatening to attack the US. Per Obama, that makes it in the interest of the US to fight ISIS. Fighting the "far enemy" has been the AQ strategy all along. It is a variation on Mao's road to victory in China by making the CCCP the strongest fighters against the Japanese. So the Obama policy is to directly engage (bomb) groups that strategize about attacking the US, and otherwise disengage from the political struggles in Iraq, and now in Afghanistan. The US will use Special Operations and Air Power, including drones, to attack those groups, but will not create or impose political solutions on those countries. Instead of trying to create regime change through invasion, it is a strategy of sidestepping governments and going directly after radical groups. It's what has been happening in Pakistan all along. Obama said as much in one of his first debates in 2008, when he said he would attack Osama Bin Ladin in Pakistan without asking for Pakistani permission. We are now 'at war' with ISIS in Iraq and Syria. So we bomb Assad's greatest opponents. But the US is not interested in helping Assad stay in power. Whatever we say, and whatever John Kerry is able to work out, we are leaving the political question in Syria to the Syrians. As we are in Iraq. As we are moving toward in Afghanistan. Which makes a certain sense. None of this is hidden, but readily available information. Sometimes, I hear progressives talk as though war in Iraq is some deeply pleasurable activity for the President to engage in, as though Obama, like Bush, has always hankered for a chance to bomb Iraq. But you have to ask yourself, "If Obama wanted a war in Iraq, why didn't he just keep the one he inherited?" No, it's not Bush / Cheney, but it does strike me as "Yes, Minister" policy- "We must do something. This is something. Therefore, we must do this." Do the architects of this policy have a clear set of goals, and criteria for ending the intervention? How well do they really understand the murky situation on the ground, in the midst of a multi-sided civil war? Is there a well thought out "first, do no harm" dimension to the policy? Color me very skeptical about the answers to all of the above. The only clear beneficiaries I see are the defense contractors. Obama's using Bush's Legal Authority. If you thought Bush's war was Illegal, well... you've got some thinking to do. The UUA's lengthy statement on peacemaking makes it crystal clear that CheneyBush's invasion of Iraq in 2003, the occupation that lasted until 2012 or so, and Obama's recent acts of war are all totally unjust. There is no moral justification for any aspect of US military policy in the Greater Middle East since 1999. I condemn the US aggression in Iraq and Syria as a UU and as a person deeply desiring to reduce the likelihood of a nuclear conflagration that could wipe out the human race. I participated in a workshop with Sharon Welch and Susan Thistlwaite among others at M/L back in 2008 and the final draft of that statement wasn't as crystal clear as you seem to think. At least to many particpants at that conference. You really need to go into some specifics because I don't recall much in it that conflicted with my support for the surge then. I know there were some upset that it allowed me to construe just that. Check the archieves of the UU Peacemaking listserv. If your claiming crystal clear authority from organized UUisms on this War, I don't see it.